The Collaboration Cycle | Flickr - Photo Sharing! bphecht, akipta, Fernando Santamaría, and 30 other people added this photo to their favorites. Nice concept map about collaboration. Wonder how a teacher can become a technology facilitator. Thanks! I think most people become technology facilitators by working as a classroom teacher and then moving into this field. If you're already a classroom teacher and are interested in tech, maybe ask around in your school. I definitely think this can be used for pretty much any coaching role - literacy, math, science, etc. I am intrigued by your diagram! 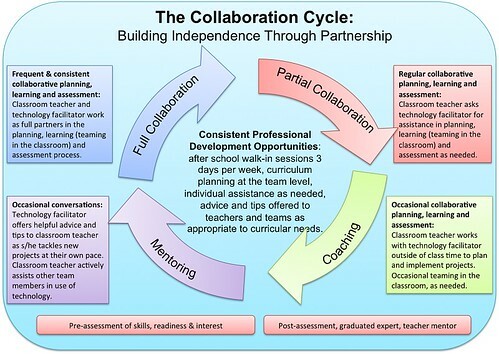 Since I'm an educational technologist in-training and working on a capstone project, may I use your "collaboration cycle" in my project? Also, would I need to do any special to be able to use it? I would be referring to it and sharing it with my capstone classmates and professors.